not one of them, but mostly all of the security assessment group will have this on their mind. They have been paid to work like a guerrilla attacking the network. Let me share with you the ancient ninja in Japan which existed since 1800, their nature haven been changed and it seem to be in practice and inherit till now to a different type of users. Ninja practice Shinobi-iri (忍び入り) which are one of the ninjutsu techniques for silent movement. This is since 1800s, look at the now. Stealth won't work anymore, we have CCTV 24x7 to monitor and a very good monitoring system to log all the auditing logs. 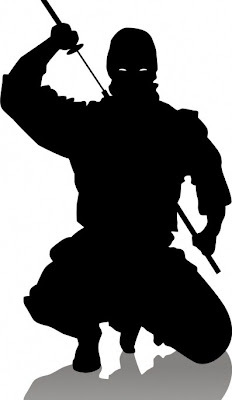 What does the modern ninja do, they use technology to stealth them self. Let me share some of it with you like TOR network or proxy. Have you ever wonder what are those areas?.I have do some research and find the core practices as below.Most probably you will ask, what does ninja have related to IT. This is mostly what the hackers do, they have more strategy, avoiding direct attack, use a different set of customized tools, espionage and etc. Till now, we don't much hear in the news mentioning, corporate network attack by ninja. Rather we hear blackhat. Blackhat practitioner they have also have the similar practice as the ancient ninja. The tools use by ninja today's will be different than the ancient. I won't be teaching you to use shuriken (手裏剣) .Along my article I will write more about the tools that they use. The most important for the ninja today's to learn is ethic, motivation and techniques. Stay tune with my articles. Let us know what you though , learns and hope for next articles!. Connect with us on GOOGLE+ , TWITTER and FACEBOOK.